Film of Matthew Hindson, Chair of the Music Board of the Australia Council for the Arts, introducing the 2010 award and inviting the Minister for the Arts, the Hon. Peter Garrett, to present the award. Warren Fahey then accepts and performs two songs from his collection – accompanied by Marcus Holden -‘With His Old Grey Noggin A-shaking’ (from the singing of George Fahey) and ‘Green Grass Upon the Green (from the singing of Bill Harney). The video was filmed at the opening concert of the National Folk Festival on the 1st April, 2010. The film was made available to the site by the National Folk Festival. The nation’s most valuable individual music prize – the Australia Council Don Banks Music Award 2010 – goes to the Australian folk icon Warren Fahey. 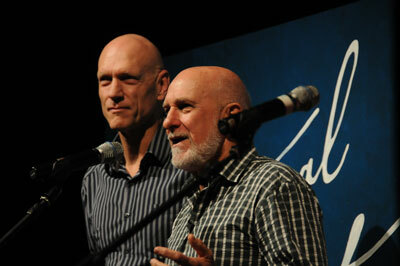 Minister for the Arts, Peter Garrett, presented the $60,000 Australia Council for the Arts award in Canberra at the opening concert of the National Folk Festival in front of Warren’s friends, family, peers and an audience of 2,000 people. Warren’s humour, endless curiosity, irreverence and bottomless swag of songs, poems and stories have been acknowledged for bringing our collective history alive. His pioneering record company, Larrikin Records, and legendary retail outlet, Folkways Music, changed the face of music in Australia. In 1971, Warren hit the road in a Kombi Van with the slogan ‘Australian Folklore Unit’ emblazoned on the side, on a mission to tape record old bush songs, stories and oral histories. Over the past 40 years, he has gathered a collection of extraordinary material including songs that he still sings today. Back in Sydney, Warren opened the doors of Folkways music in 1973. The store became internationally recognised as the destination for Australian music and specialist music from around the world, complete with a major mail order business and internationally popular annual catalogues. Warren Fahey then established Larrikin Records in 1974, a label that has released over 500 recordings of Australian artists, including Eric Bogle, The Bushwackers Band, Redgum and Robyn Archer. Larrikin pioneered the release of Indigenous music with nearly 90 recordings and was the first record company to pay royalties to Indigenous communities. Warren sold Larrikin Records in 1995 and took on the role of Deputy Managing Director at the Festival Mushroom Group for four years. In 2002, he established Undercover Music and Rouseabout Records. He has also served as a Governor on the ARIA Awards Board and a Director at the Australian Recording Industry Association. In 2008/9 he was Chair of Folk Alliance Australia. He has received the Order of Australia, the Centennial Medal and the Advance Australia Award and the Republican of the Year Award. And Warren isn’t slowing down. He continues to spend his considerable energy furthering his collecting and research work and performing with his group, The Larrikins. In 2009, he released a 10 disc collection of Australian folk songs and this year releases a further two CDs and a new music book. As he receives this top Australia Council award, Warren’s passion finds yet another outlet with an extensive installation marrying Australian folk song with archival film, photographs and illustrations to create an immersive journey through the convict and industrial history of Cockatoo Island in Sydney Harbour. Damned Souls & Turning Wheels opens in May as a highlight of the 2010 Biennale of Sydney.